Somewhere along the way in the last several years, I’ve developed quite a taste for what I think of as fall and winter spices. I’m talking about cinnamon, nutmeg, allspice, cloves, etc. 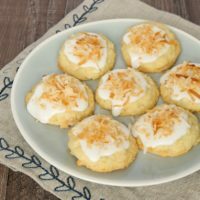 I just love combining them for big flavor in my baking! 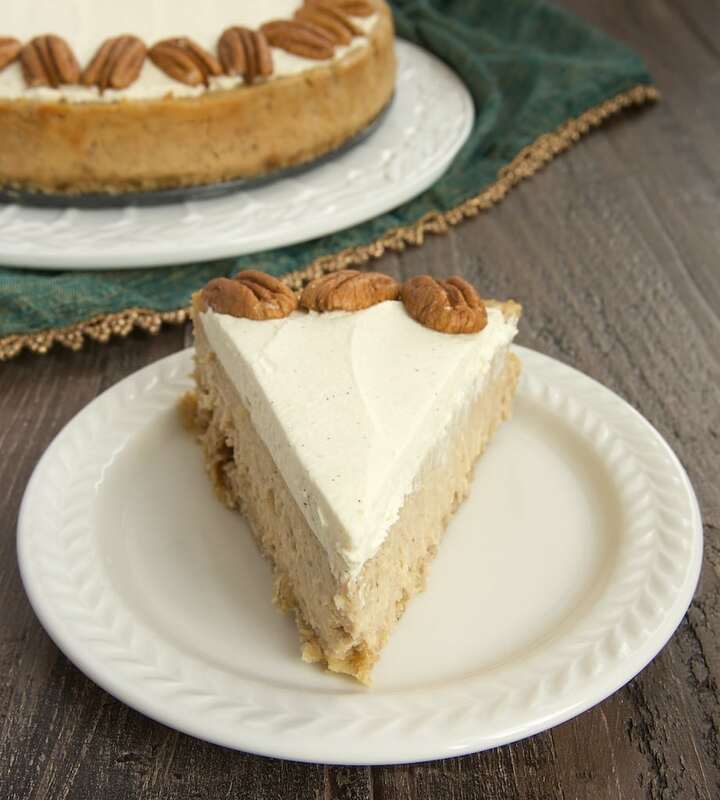 When I first thought of adding all that spice action to a cheesecake, I have to tell you that I couldn’t get in the kitchen fast enough! 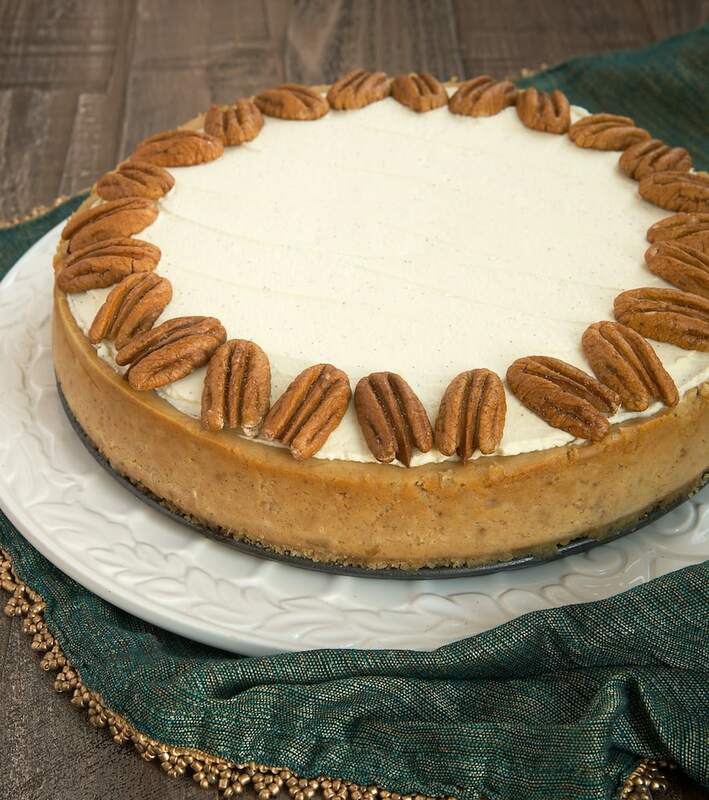 I love baking cheesecakes, and the thought of a Spiced Cheesecake was too tempting to pass up. I decided to start with a crust that’s much like an oatmeal cookie. It seemed like the perfect companion to all those spices. A cookie crust would work well, too. Graham crackers, vanilla wafers, or speculoos would all be great choices. The cheesecake itself is pretty straightforward. 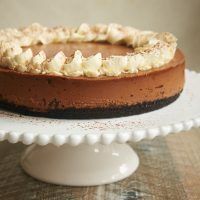 It’s your basic traditional cheesecake but amped up with a little brown sugar and a blend of spices. Then it’s topped off with a sweetened vanilla bean whipped cream and a few toasted pecans. As always, I used PHILADELPHIA Cream Cheese for making this beauty. It has been my cream cheese of choice for many years. I love knowing that it’s fresh and that the traditional cream cheese has no preservatives. Let me tell you, my friends, that this cheesecake is amazing. It’s absolutely beautiful and wonderfully delicious. If you’re looking for a special holiday dessert, this may very well be your answer. Preheat oven to 350°. Grease a 9-inch springform pan. Using an electric mixer on medium speed, beat brown sugar, butter, and vanilla until light and fluffy. Reduce mixer speed to low. Add flour and salt, and mix just until combined. Mix in oats. Press mixture evenly into bottom of prepared pan. Bake for 10 minutes. Then set aside to cool slightly. Using an electric mixer on medium speed, beat cream cheese, sugar, and brown sugar until well-blended and smooth. Add eggs and vanilla, and mix until combined. Add cinnamon, allspice, nutmeg, and cloves, and mix well. Stir in sour cream. Transfer batter to partially baked crust and spread evenly. Reduce oven temperature to 200°. Continue baking for 2 hours. Turn off oven. Remove cheesecake from oven and gently run a knife around the outside edge. Return cheesecake to oven. Leave cheesecake in oven for 2 more hours. Cool to room temperature. Then cover loosely and refrigerate overnight. Sprinkle sugar over the cream. Whisk until combined. Add vanilla bean paste and continue beating until you can lift the whisk out of the whipped cream and a peak that curves downward forms in the cream. This should take 4 to 5 minutes. Spread whipped cream over cheesecake. 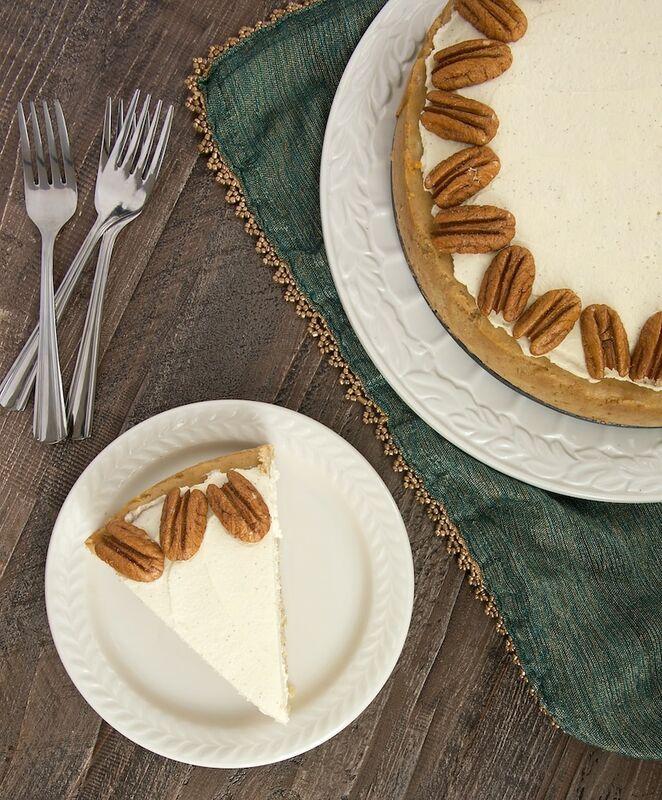 Garnish with toasted pecans. Disclosure: I have been chosen by Kraft Foods to be a spokesperson for Philadelphia Cream Cheese. I have been provided with compensation for my time. All opinions are my own. 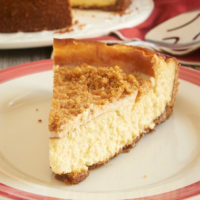 For more cheesecake inspiration, be sure to visit www.creamcheese.com. After running the knife around the outside edge, do you remove the springform side and then return to the oven? Hi, Gordon. You’ll need to leave the sides of the pan intact until after the cheesecake has chilled. Ooo I’ve been wanting to make a cheesecake with the cream topping for awhile. IDK why I don’t do it normally but I just don’t. And I need to fix that. Love the crust on this too! Always fun to change it up and it goes perfectly with the flavors here. I’ve made an apple pie cheesecake before and the spice in the cheesecake definitely is a good thing. Love the whole concept! Wow, this sounds so amazing. I love those warm spices as well, and cheesecake seems like the perfect vehicle for them. 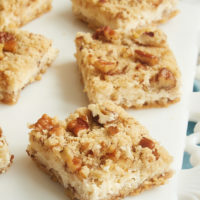 And oatmeal cookie crust is just genius! 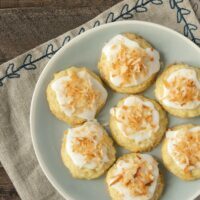 Would the whipped cream topping stand up to a couple days in the refrigerator before it is served? Hi, Kate! It should keep for a few days. 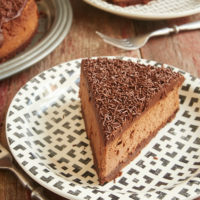 Alternately, you can make the cheesecake in advance and then make the topping when you’re ready to serve. 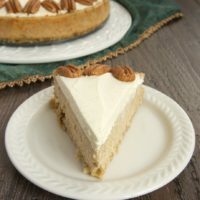 Can you use quick oats for crust instead of old fashioned oats?